The dancing emerged in an improvised fashion, but since the very start, it has been decisive for the tango. This is a very personal and suggestive dance that lies on rhythm, unlike the music based on melody. Another singular feature is that, when the tango is danced, while the legs draw figures on the floor, the torso sets a different movement. At the beginning, it would emulate some steps from the candombe and the dancing couples, instead of approaching each other, would get away from one another following the rhythm. The rhythm of tango is based on a 4/8 beat and dancing it only takes walking this basic nucleus of four steps following the rhythm. Figures can be added, but the most important issue in order to be a good dancer is to "walk the tango" and that means within the rhythm. The tango has a soft undulation and a bold rhythm. It is not danced at will or with stiffness. Shortly after becoming well-known, the compadritos took it to the Corrales Viejos neighborhood and the tango invaded the piringundines where the traditional milonga was already being danced. Real parties would be held there and many of these places were quite popular for their good milongueras, such as "the" Carmen Gómez, who would dance in a hovel near the old Lorea Square. The boldest and most skillful braggarts were the ones who used to dance the tango not only with their feet but also with their knives. Tango dancing used to be learnt by trial and error and the steps were practiced in order to be performed before an audience. Later on, learning tango passed onto the family and, by the 1970s, parents would teach their children, big siblings to the younger, and aunts, uncles and cousins would exercise their steps dancing with one another. Untransferable experience of the body. 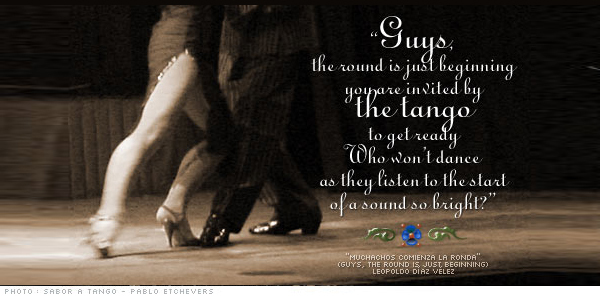 Magic in the encounter, in the soul there is no more room than the room for the tango milonguero. Let there be no shaving left on the academy floor. The patent leather shines while following the rhythm. Embracing the waist and looking into each other's eyes, that is the way the tango is danced, with feeling and passion. In 1904, Casimiro Ain and his wife showed off as tango dancers at the Ópera Theater. They were followed by distinguished dancers such as Ricardo Güiraldes, Florencio Parravicini, Jorge Newbery, Benito Bianquet and Tito Lusiardo, among some of the eldest. As a result of dancing, the tango reemerged in 1913 after its first crisis, when it succeeded in Paris and Rodolfo Valentino danced it in a scene of the movie "The Four Horsemen of the Apocalypse". It also experimented a new impulse in 1985, when the Tango Argentino Company, made up by Juan Carlos Copes and María Nieves, Nélida and Nelson, Gloria and Eduardo, Mayoral and Elsa María, Virulazo and Elvira, María and Carlos Rivarola and the Dinzels, trimphed at Broadway with a memorable show. Created and directed by Claudio Segobia and Héctor Orezzoli, it was presented all throughout the United States and Europe and let the tango be brandished as an international artistic performance. Carlos Gardel was the one who fostered the passing of tango from the feet to the voice when, in 1917, he sang the first tango, which was called "Mi noche triste" (My Sad Night). But that is a different story. Lyrics: Marvil (Elizardo Martínez Vilas).